Dr. Richard Henderson, Ph.D.; Dr. Dorothy Ettling, Ph.D.; Dr. Jessica C. Kimmel, Ph.D.; Dr. Robert E. Zeigler, Ph.D.
A great deal of literature confirms the fact that small family-owned businesses rarely extend beyond the founder of the business. This study explored and identified factors that helped to create a successful family business transition for two African American family-owned businesses in the San Antonio area. One family experienced working through a well thought-out succession plan that successfully passed the mantel from one generation to the next, while the other family experienced going through an unexpected, unplanned business succession that was also successful. 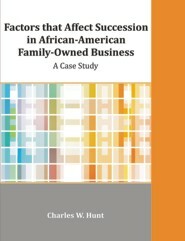 Understanding the factors that help create a successful family business transition is difficult because there is very little scholarly research that has an in-depth focus on the African American family business. The research design used was a Phenomenological Qualitative Historical Case Study. The findings revealed that both families' success may be attributed to factors such as being raised by both of their parents and being taught family values, hard work, responsibility, and accountability. Self-preservation, the first law of nature, was taught to make them aware of the importance of taking care of self first, so they could take care of others. As children, they watched their parents at work, which gave them the opportunity to shape and mold their own work ethic with a strong family influence. Most of the children in both families were socialized into the family business and never worked elsewhere. Both families were very active in church and made the church the center of their social life. All of the family members had mentors and/or role models as a child, at school, and at work. The researcher concludes that it is important to note a plan for succession should consist of three elements, all of which must precede the actual succession by a few months. A plan for succession occurred in one case; however, in the second case, it occurred several months after succession took place. Charles W. Hunt graduated from Bishop College with an undergraduate degree in Business Administration. After obtaining a Masters in Management at Webster University in 1994, he completed a Ph.D. in Organizational Leadership from the University of the Incarnate Word in 2006. The author is currently a tenured Professor/and Coordinator of the Business Management Program at San Antonio College, one of the Founding Members of the Talented Tenth Scholars, and Life Member of Omega Psi Phi Fraternity.